When Saturn’s mining settlement is attacked by warmongering aliens known as The Wretcheridians, the newly-commissioned First Fleet of the Intergalactic Space Navy races back from the edges of the solar system to mount a fierce defense against the invaders. Outgunned and outnumbered, the brave young ISN officers strategically drive the battle deep into the rings of Saturn to begin a deadly game of seek and destroy. Command the ISN fleet and defend the settlement. Or lead the attack as the commander of the ruthless Wretcheridian invaders. DESIGN YOUR FLEET: Choose from solo ships or squadrons in a variety of sizes, strengths, weapons, special powers and more. BUILD YOUR DECK: Use your Tactic Cards strategically to add weapons, heroes, powerful attacks and ship upgrades. REVEAL, MOVE AND ATTACK: Command your fleet as it finds and fires upon enemy ships. Destroy their fleet before they destroy yours. INCLUDES A 48-PG GRAPHIC NOVEL: Meet the heroes. Witness the battles. Watch the epic adventure unfold. Jeremy's notes: Battleship Galaxies is one of the most enjoyable gaming experiences of 2011 due to its overall ease of play and solid mix of strategic choices, easily making it one of the most pleasant surprises of the year. I’ve been looking forward to a new board game from Hasbro for some time now. Growing up I played games with great components such as Chopper Strike and Carrier Strike. The idea of a new space combat game from the designer of Heroscape along with the pictures of the ships made Battleship Galaxies a must buy for me. – A lot of fleet building options from different ship variants and weapon assignments. Handle all kinds of complex situations: Boarding actions, sabotage, etc. Obstacles are what you’d expect: Astroids, wreckage, etc. Can use as cover. Discoveries start face down, and flip when a ship is on them. – While comic fluff is great, the names of both forces are un-inspired. My first exposure to Battleship Galaxies was to stumble across it at the 2011 Origins. Upon approaching it and getting a first look at the box, my first reaction was literally: “oh… Battleship… OH! Galaxies!” I’m a sucker for space-themed games, and with yet another new twist on an old game (see also: Sorry Sliders, Yahtzee Free-for-All, Risk Legacy), I couldn’t help but be intrigued. Despite carrying the branding, there is actually very little of Battleship left in Galaxies; it borrows as much if not more from Craig Van Ness’ magnum opus Heroscape. 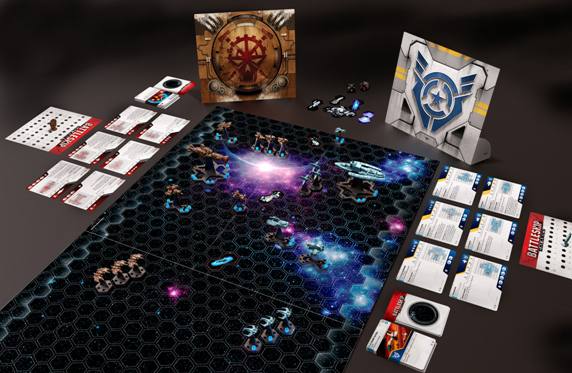 The game comes with a book full of scenarios the two players use to establish a fleet of spaceships to be used, the layout of the board, the winning objectives and other conditions for the game. The ships come out onto the board occupying one or more hexes and moving along those hexes to traverse the board. The player has a broad scope of options for when to bring out his ships, how to position them strategically, when to move into weapons range and go after the enemy, and so on. The players also have a deck of cards that add new crew members, upgrades and other benefits to use to their advantage. The one key piece of nostalgia brought over from classic Battleship comes in combat; the player rolls two dice, one containing letters and the other numbers. He calls out his result: D-7, which the other player consults a chart for his ship to see if that coordinate hits the ship or not. Hitting a ship will drain away any shields it may have, then damage it up to a point where it is considered destroyed. Each player has a variety of ships from snub fighters to capital ships, with varying levels of shields, hit points, movement speed, firepower, bonus effects, and so forth. However thin the thread to classic Battleship, this game hits a lot of points that I like in games: a space theme, variety in play pieces, great sculpted miniatures, methods to mitigate some of the chance found in rolling dice for combat. I look forward to playing through the full breadth of scenarios and coming up with some of my own. Battleship Galaxies is a surprisingly enjoyable reimagining of the ‘classic’ Battleship game. The deck building and fleet drafting is simple and straight forward enough for rookie-gamers to pick up, and the game play is simple enough to explain in a few minutes. The base game comes with several missions to play through that provide a decent amount of variety, however it really is begging for expansions. The fleet decks provide a fairly limited number of build options, but both factions employ very different strategies and mechanics. The quality of the components and box is fantastic. The unpainted miniatures are nicely detailed, however they’re quite rubbery and susceptible to wings bending out of shape. The box includes ample space to re-store all the components after unpacking them easily. Battleship Galaxies is brought to you by Wizards of the Coast and the same designer of once popular “HeroScape” game, Craig Van Ness. In this game, you play either the invading and aggressive alien force “the Wretch” or the defending humans of the USN fleet protecting Saturn. It has very little to do with the old classic Battleship game that we all grew up with in our youth. Each game begins with a scenario setup that details which units you’ll use and which cards will be in your deck. There is a way to draft your deck as well if you want to do that. To win, scenario objectives must be completed. The game combines tactics, deck building, die rolling, and miniatures in a really cool way. Adding and removing pegs for shield and hull strength can be clumsy at times. The gameplay is fairly simple and turns are divided up into three phases: energy, deployment, and action. Once the board and scenario is setup, each player begins their turn by adding a certain amount of energy to their energy pool (based on the scenario). The energy you receive is basically your currency to do your actions. It costs energy to deploy ships onto the board, to activate ships for moving and attack, and to activate certain cards in your hand or attached to your ship. Each ship has it’s own strength and weaknesses, and each player maneuvers their ships to complete their objectives to win. Combat is fairly straightforward. Hits in combat are scored by rolling a numbered and lettered die to produce coordinates, and then resolve the possible hit by looking at the target ship’s card with said coordinates. This is where you roll a “B4”, and your opponent says “Hit” like in the old Battleship game. A hit will reduce the shields or hull based on the power of the gun’s capabilities. Each ship also has a “critical” hit coordinate that can completely destroy the ship if shields are down even with full hull strength which makes for some exciting plays. Battleship Galaxies is really good space battle tactical game. It seems like the Wretch are a little too strong at times, but it’s not impossible to beat them. The game shows a lot of promise in that it could easily be expanded with more space fleets with different strengths to add to the mix. I really enjoy the game, and I was looking forward to getting some expansions to it. However, it doesn’t look like Wizards of the Coast/Hasbro is going to continue to support it, based on the latest rumors of this writing. They didn’t do a very good job of promoting it to start out which is a shame. My favorite part of the game is how you can enhance your game play with both tactics cards and ship upgrade cards. I like how you hide your units before deploying them, so your opponent doesn’t know what you have or how many ships your bigger ships could be carrying. This game should appeal to the kid in you with the cool spaceships, and the comic book that comes with is pretty neat. My son and I have really enjoyed it the few times we’ve played. Even without expansions, it’s still a solid game and fun to play. So if you need to scratch that tactical sci-fi space combat itch, this game will do it. If you’re looking to go deeper with more variety, you can always hope that an expansion will come out from either Hasbro or someone else buying the license. It should appeal to avid gamers and family gamers with older kids. If there were more expansions, I could see power gamer flocking to this. Avid gamers should enjoy it because it combines a lot of neat mechanics with a good theme. It’s fun romp and a good game. Add a Review for "Battleship Galaxies"